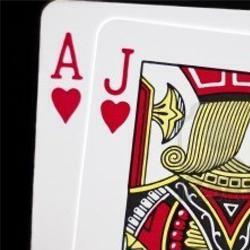 Blackjack has always been known as a game where house and player odds are extremely close. With 5 diamond blackjack, the player takes on the advantage and jumps into a situation where bonuses and big money are one “21” away. The player is given 5 hands to try and beat the dealer. A total of 21, a number that’s higher than the dealer’s hand, or getting a diamond symbol will all payout and make you a winner. Given the amount of hands you get to play, it’s very possible that you’ll be able to win multiple hands in one draw. Players can win in a variety of ways. By winning free cards, prizes, and the value of your bet, players can find multiple ways to win and become eligible for the random jackpot. Note, that a payout maxes out at 4000:1 and at the very least you’ll be able to win back your wager. For those who want to practice before playing for money, 5 Diamond Blackjack offers a “fun mode” where players can play for free and practice different strategies. This is a great way to start, especially since most people aren’t familiar with a 5 on 1 approach in blackjack. If you’re looking to make money on blackjack, you’d be hard pressed to find a better option than 5 Diamond. Silver Oak’s most popular blackjack game, for good reason, is one of the best paying 21 games on the Internet. Take a gamble and jump into 5 Diamond Blackjack – you’ll be glad you did.